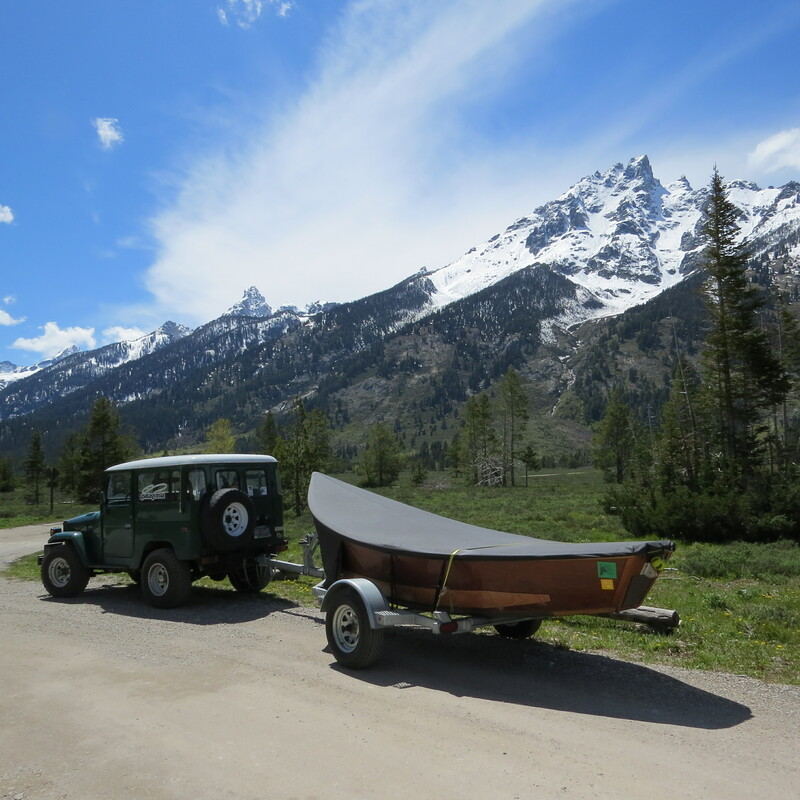 In the past few years my boat, the “Obsession” has traveled a thousand rocky river miles in all kinds of weather, dodged a million rocks (and hit more than a few) while running rivers in Yellowstone, Tetons, Olympic, Rocky Mountain, Rainier and a dozen other National Parks. 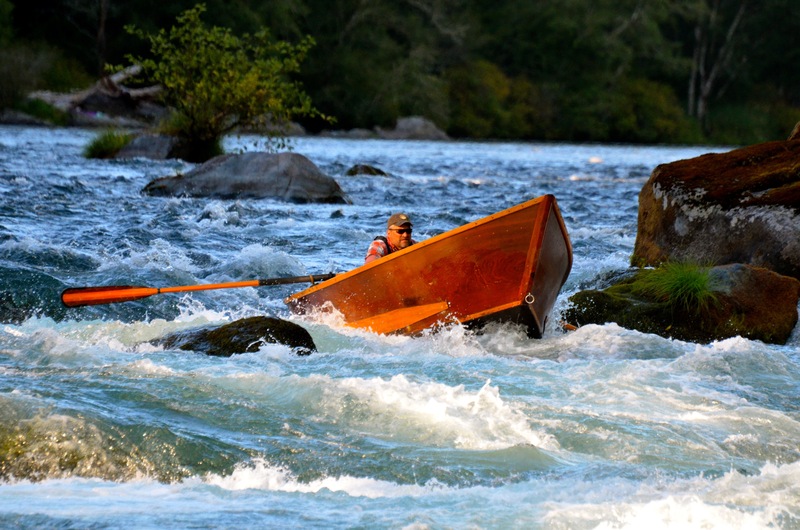 It has run “backwards” through a tricky rapid on the Rogue River called Black Bar, been spun around at the top of Martens Rapid on the McKenzie River in a precarious side-ways run through the rapid, and it’s slammed into a canyon wall so hard it split a rib, shattered an oarlock, and put my boat out of commission for a month (Mule Creek Canyon). Backwards through Black Bar on the Rogue Wild and Scenic. Photo by my friend Scott Vollstedt. It’s given me more pleasure and pride than just about anything I have done in my life and taken me to wild and scenic places I never dreamed existed. 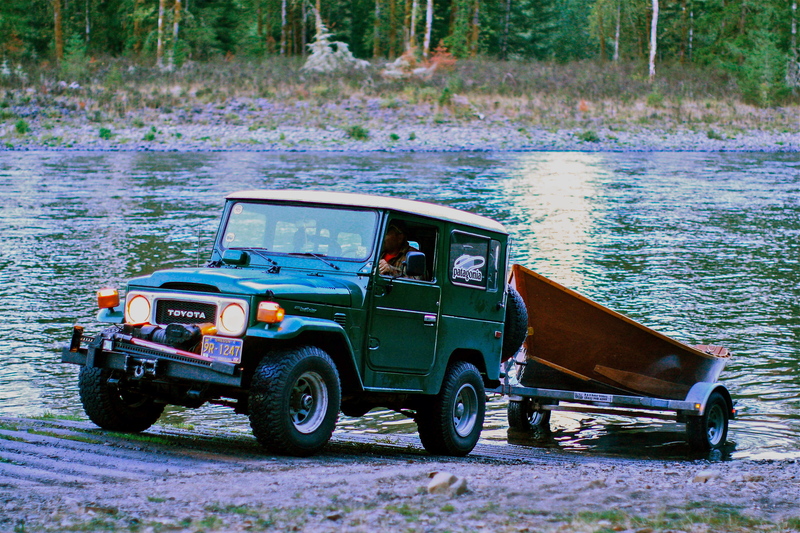 It connects me to the river with a bond that comes from having built it, rowed it, wrecked it, and repaired it – with my own two hands. The boat runs deep. It’s given the guests in my boat experiences they will remember for the rest of their lives. 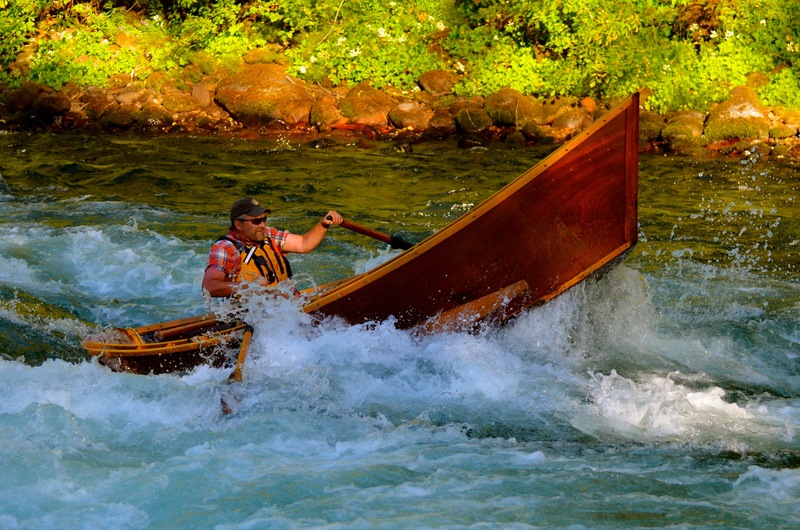 Wood Boats “rock” on the Cowlitz River. Photo by Seth Patterson – fellow adventurer. 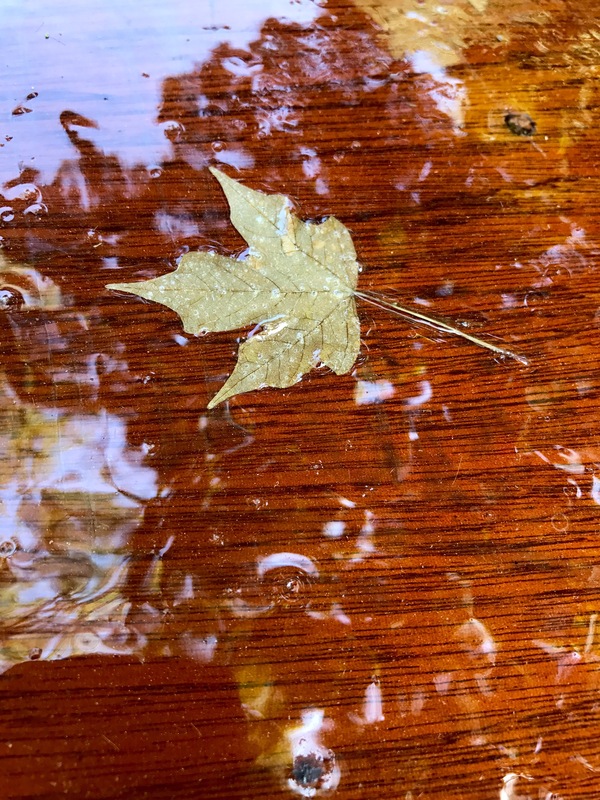 It’s a handcrafted drift boat made of wood and every mark on it represents a story of adventure and a brush with disaster. 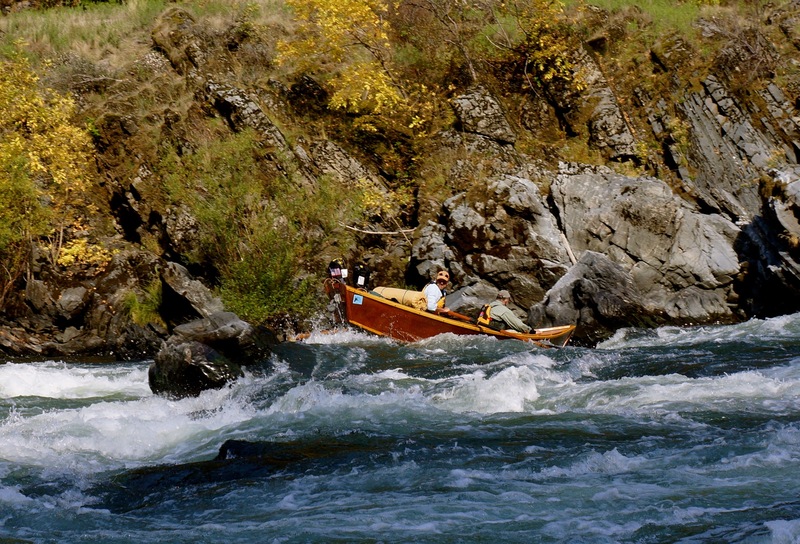 This boat has spent a lot of time at the intersection of Chaos and Calm where worlds collide on the rivers out west. 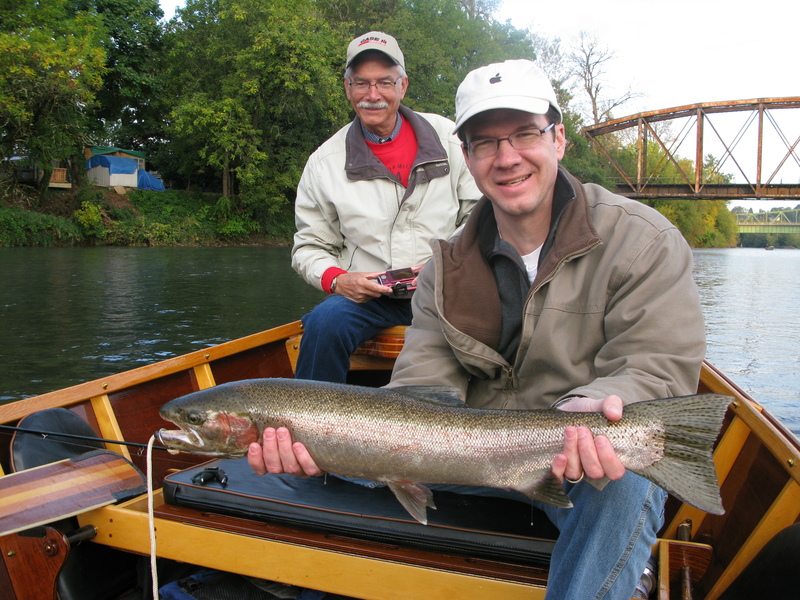 The test of nerve and skill in a boat made of wood is a challenge I’m as passionate about now as the day I rolled my “Obsession” down the boat ramp for the very first time over ten seasons ago. First, I took the boat off the trailer and turned it upside down. 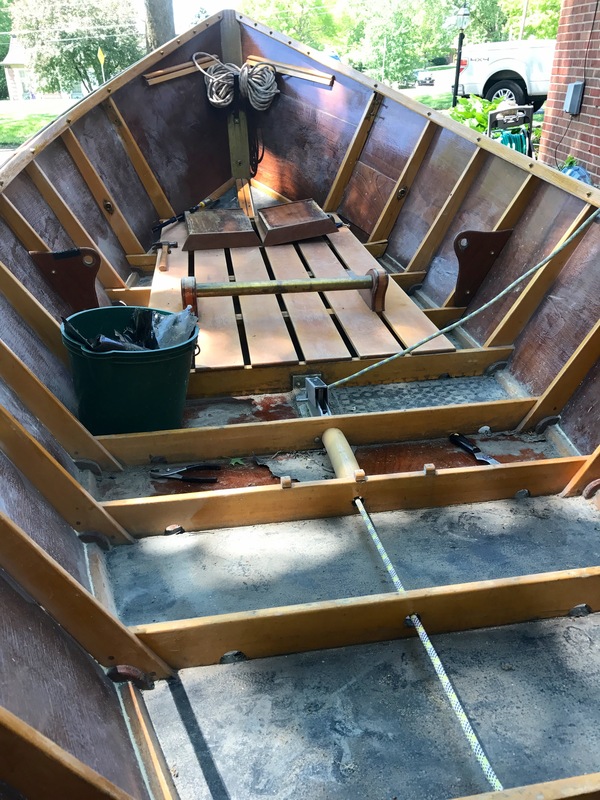 I removed about 70 stainless steel screws and removed the quarter inch UHMW plastic shoe from the bottom of the boat so I could repair a few cracks, checks, and “push-ups” in the wood bottom. I was relieved that there were no serious holes or dead spots. 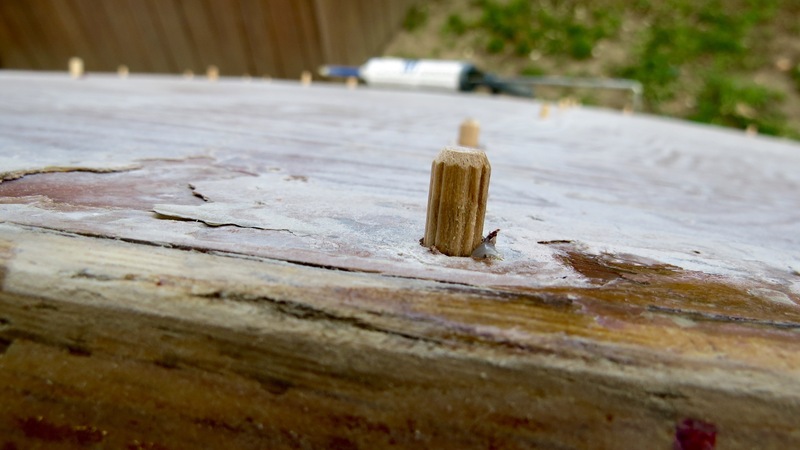 Drilled out and plugged every screw hole in the bottom of the boat (every screw represents a point of entry for water and “eventually” the water will find a way to seep in and rot out the wood around the screw). After lots and lots of sanding, I resealed the wood bottom with two coats of West System epoxy until the bottom was as smooth as glass. 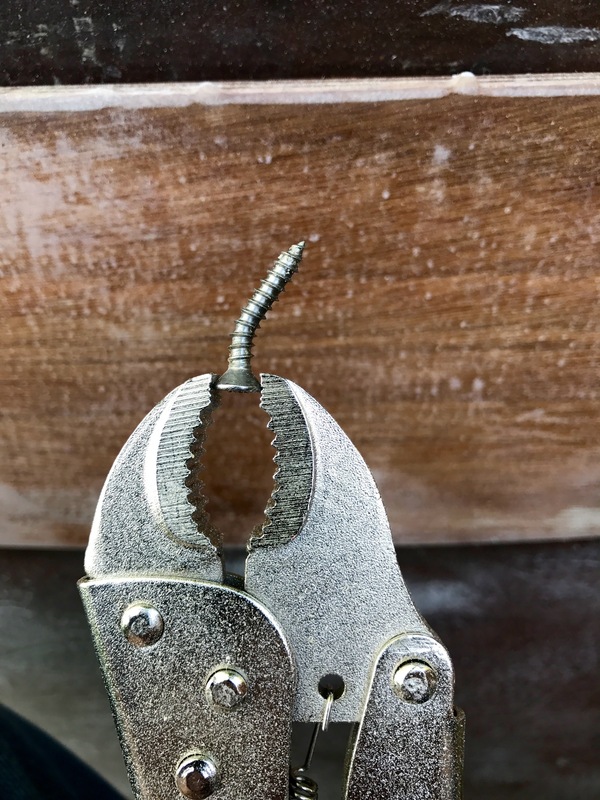 Once the bottom was sealed I reattached the plastic shoe by drilling fresh holes and using new stainless steel wood screws bedded with marine calk. Then I flipped the boat back over and went to work on the interior of the boat. 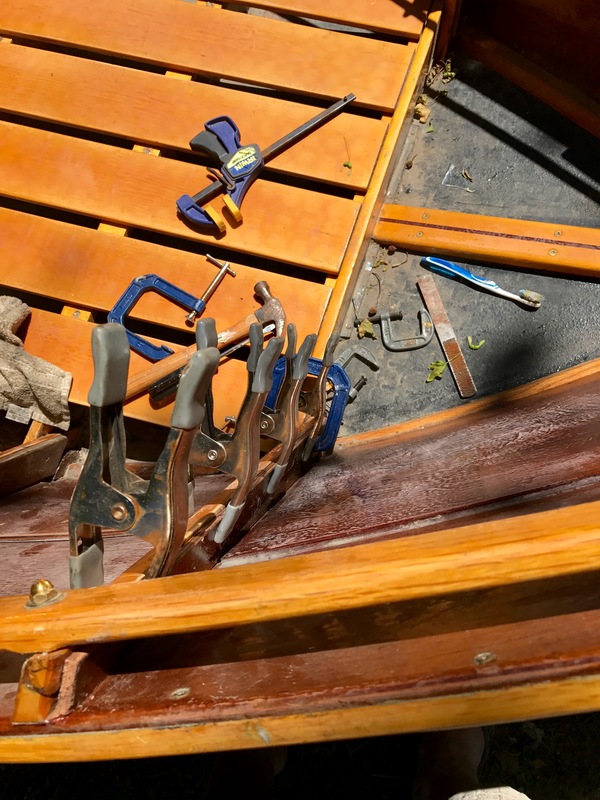 First I needed to repair and reinforce hairline cracks in three Alaskan Yellow Cedar boat frames #1, #2 and #9. As part of that process, I removed the oak dashboard with the mahogany knee braces and stripped and refinished every inch of it. 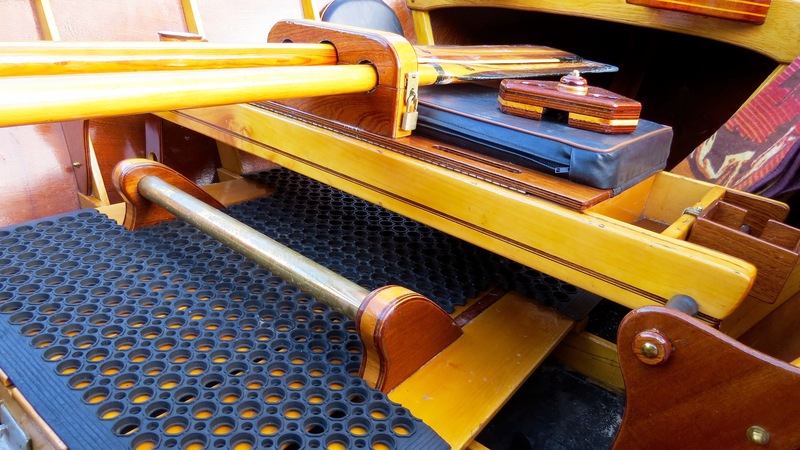 I also removed the mahogany fly deck in the front of the boat and stripped and refinished it. On the inside bottom of the boat, I stripped the weathered faded Durabek floor liner, repaired all the inside push-ups by sanding down the “checking” and repaired it with West System Epoxy. When it was smooth as glass, I reapplied a fresh coat of Durabek floor covering (similar to truck bed lining – applied with a roller and paint brush). 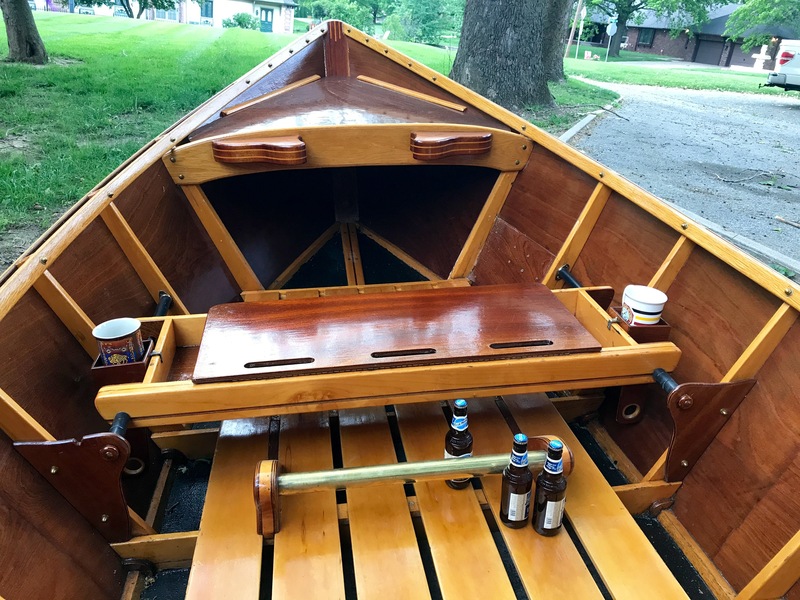 I repaired and refinished the “fun stuff” – the cup holders and passengers bench-seat, the mahogany rod holder and the fly boxes on the rowers thwart. 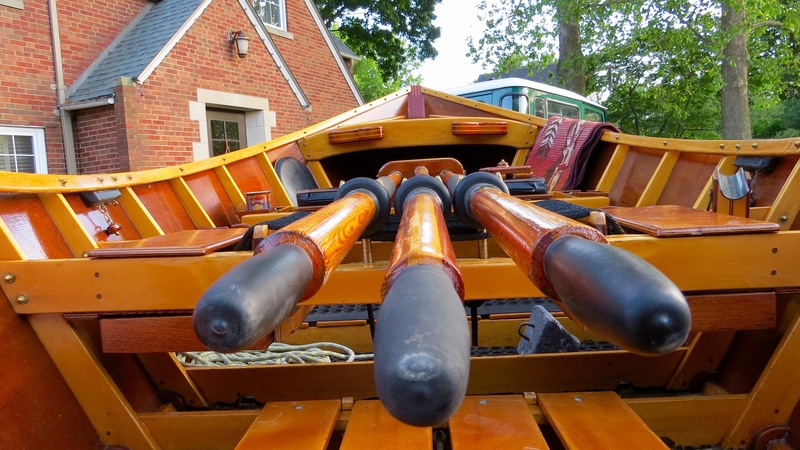 I reworked the oar lock pins and rebuilt the mahogany drawers on the rowers bench… and then……. I did something I’ve wanted to do for several years…. 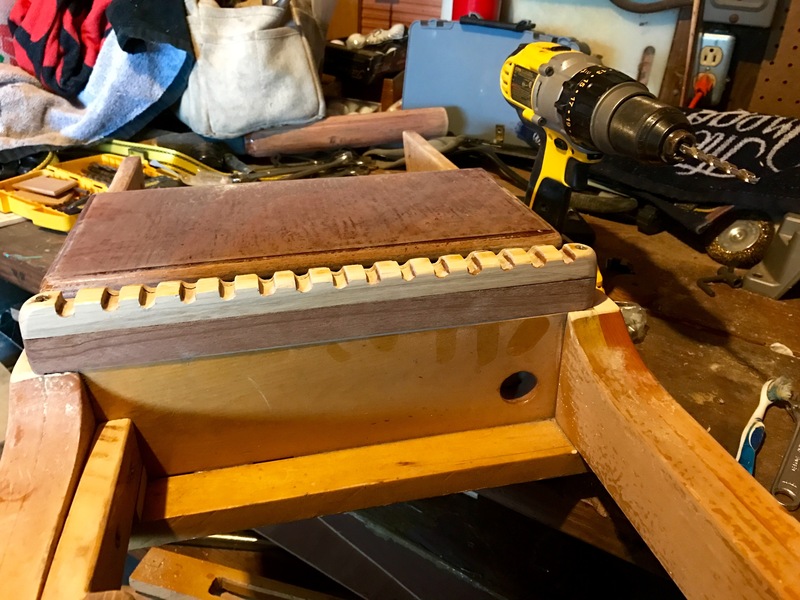 I redesigned the rowers seat and raised it up two inches by adding a solid piece of mahogany to the braces on each side. The result is an elevated platform with a better view of the river over the heads of my passengers in front. 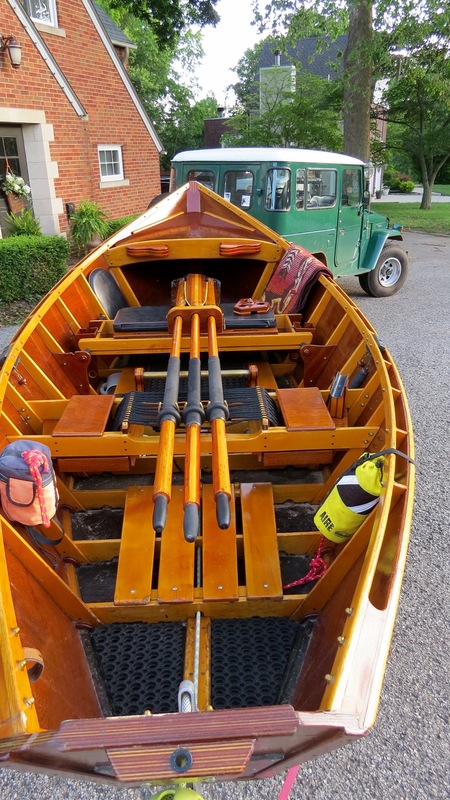 To make the rowers seat “pop”, I restrung the rope seat with new black rope. The yellow cedar floorboards in the front and the back needed work – so I sanded them down and refinished them. I also added a floor lock to the floorboards in back to keep them from flopping around (wanted to do that for years, too). 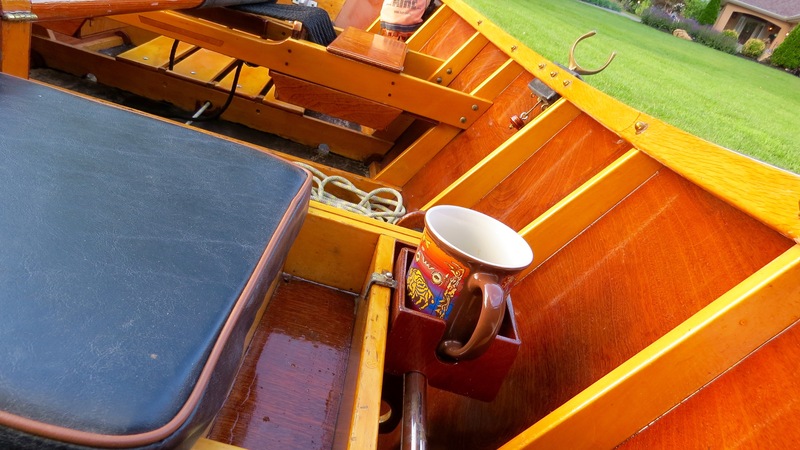 The “Bar in my Boat” gets a lot of use. 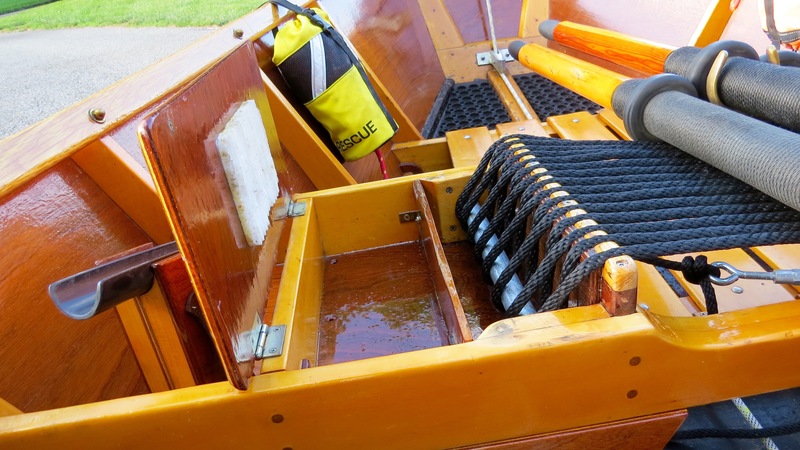 I designed it and built it to give my feet something solid to push off of and give me greater leverage and power when I really need to move the boat. While I loved the patina and tarnish of the brass bar, I polished it and refinished the support braces. I repaired and refinished the mahogany front stem on the boat which was looking a little beat up as the first line of defense when my boat hits high rocks or canyon walls. I built it as a replaceable piece so when it becomes too busted up, I can build a new one and replace it. 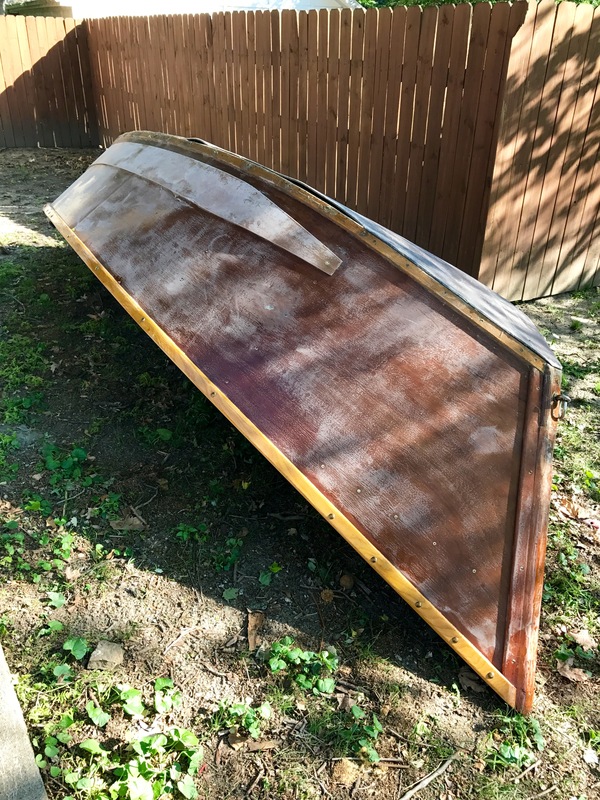 The last thing I did was lightly sand the entire boat and then applied three coats of Z Spar Flagship Varnish – inside and out. It took almost 100 hours of attention, one gallon of West System epoxy (207) one tube of Six10 epoxy, one gallon of Pettit Z Spar Flagship Varnish, two quarts of Durabek for the floor, forty feet of rope, 75 discs of sandpaper (220 grit), 120 new stainless steel one inch wood screws, seven paper oxygen masks, a ton of patience, and a little obsession. Kickin on the McKenzie. Photo by Lillian Howard. 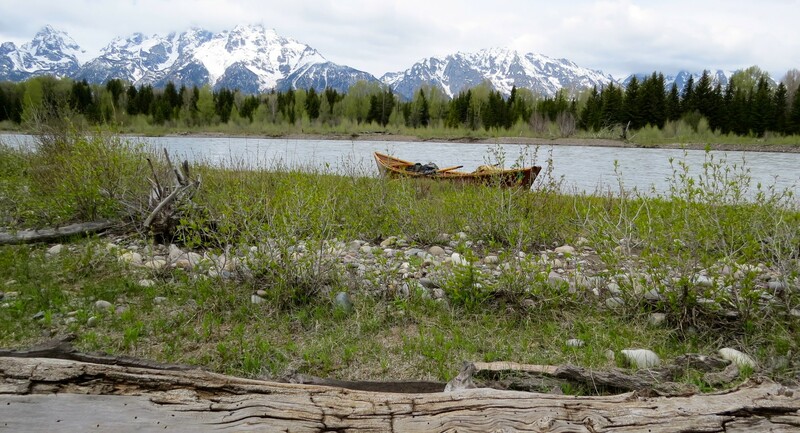 There is a busy season of boating ahead and a number of National Parks on the agenda including: the Buffalo National River, Teddy Roosevelt National Park, Glacier National Park, and the Wild and Scenic Middle Fork of the Salmon River in Idaho. Many of the scars on the boat are still visible and most of them have a story that I can remember. Every single one of the marks and dents are evidence of heroic runs, colossal blunders, lucky breaks, bad timing, and close calls in a boat that has visited some of the most beautiful and treacherous rivers in North America. They are marks of character and I’m kinda proud of each one. More details on my boat “makeover” will be listed in an upcoming article I wrote for Epoxyworks from West System.